Starting as best kept secret the group Incognito has reached meanwhile cult status worldwide. Fourteen studio albums, thirteen compilations, live or remixed albums and several site projects. Fans of Incognito really haven't to complain about a lack of activity. The group is constantly touring around the globe and isn't to shy to play in stadiums or small clubs. The band's frontman, composer, record producer, guitarist and singer is Jean-Paul 'Bluey' Maunick. He assembles around him a variety of musicians open for new style and streams. The new album Transatlantic R.P.M. was recorded in studios in London and California, which explains the title of the new album. “It’s about actually making that physical journey to America to collaborate with those artists from my record collection who came over from there, brought their music to the UK, and really influenced what we did back in the day," comments Bluey. Following this idea he invited well-known artists of the new world to join his recordings. Bluey continues: "People like Chaka Khan, Leon Ware and Al McKay are artists of the same mind as us, in that they don’t play this type of music just because they only know how to play their old songs. So, when we all work together, we’re constantly trying to still get maximum creativity out of this." Bozz Scaggs' super hit from 1976 Lowdown is brilliantly covered by the vocal dream duo Chaka Khan and Sicilian crooner Mario Biondi. Both singers are the reference of adult contemporary vocalists. Everything That We Are features singer and rapper Lucky Iam aka Tommy Woolfolk, who is always touring around in several hip hop formations. Typical Incognito is the horn arrangement and the vocal harmonies, their signature sound since Jazz Funk. With 1975 presenting singer Joy Rose Bluey gives some inside of history. Joy Rose shines with the vocal lead and their cries. Who says that Chaka's style cannot be copied? The soulful love ballade Your Sun My Sky brings Maysa onstage. A song that doesn't challenge this blessed singer too much. Leon Ware is not just an excellent soul singer. He is also a great composer with hits for Marvin Gaye and Michael Jackson. Line In The Sand presents this legend with his unique timbre. Jean-Paul 'Bluey' Maunick also stretches out to new personalities like Ursula Rucker, who is known by her own style of spoken words in the world of hip-hop and neo-soul. Gotta is her stage. Drummer and singer John-Christian Ulrich is a member of the group Tortured Soul offering jazzy, funky and romantic dance tunes. Their album Introducing Tortured Soul found Bluey's interest. Let's Fall In Love Again is the result of their first collaboration. The Song is Chaka Khan's second appearance on Incognito's new album. The lyrics are rather simple, but the harmonies are just divine. Singer Tomy Momrelle is since nine years an integral part of the group Incognito. His similarity to Stevie Wonder's vocal vibe is a big plus for the group. Put A Little Lovin' In Your Heart is Tomy's coming out. The beautiful Joy Rose is also lead songstress on All Of My Life. She has great range and potential. It's up to her to reach the stars. Expresso Madureira was originally recorded by the group Banda Black Rio. Their sound is similar to Incognito and EWF performing soul, funk, jazz and dance music. The group had great success in dance houses in UK in the 90's, where Bluey got familiar with their music. 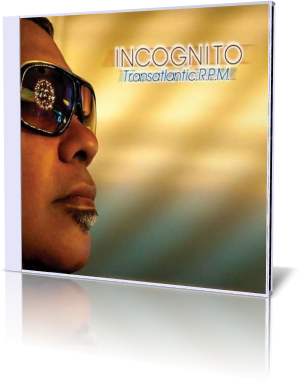 This tune is a true showpiece for Incognito and part of their contemporary touring program. Featured star of Life Ain't Nothing But A Good Thing is London based Vanessa Haynes. The experience with Incognito is certainly a great step for this young talent and a propellant for her further development. Although Make Room For Love is Tomy Momrelle's vocal piece, the real treat is trumpet and Flugel horn player Kevin Robinson, who shines with brave tones. Can't Get Enough is somehow a hybrid between instrumental and vocal piece with Italian singer Mario Biondi as heavy weight on the vocal part. Nevertheless the instrumental section rules. The interlude The Winter Of My Springs introduces recording engineer and now programmer Mo Hausler, who opened his own studio in partnership with Jean-Paul ‘Bluey’ Maunick in early 2010. Mo recorded, mixed and mastered the whole album. The ballade Tell Me What To Do is the seldom opportunity to listen to Bluey as lead singer. My last shout-out to keyboardist and composer Matt Cooper, who is to a big part responsible for the great success of this album. Transatlantic R.P.M. is Jean-Paul 'Bluey' Maunick's most adventurous and expensive album. The album has some experimental moments, but overall you find the music you await, pure Incognito!